I am really annoyed by seeing the notification balloons popping out in my Windows 7 PC every time when there is a check for security, windows firewall etc. Is it possible to disable it permanently? Can you tell me how to do it? Re: How to disable the notification balloons in Windows 7? STEP 1: Open run command from start or press Windows key + R and type regedit -> press Ok. STEP 4: Restart your system once to see the change. Note: When you disable this even important security messages you won’t be able to see, to revert back to the default delete the value which created. Firstly, Go to Control Panel and from the System and Security section, select Review your computer’s status.Now in [COLOR=#0099FF !important]the left menu, select Change Action Center settings. [/COLOR]Next, you should remove the tick marks from the notifications you don’t want to receive in the Security messages and Maintenance settings sections.Once you’re done with it, click OK. STEP 1: Open run command from start and type regedit -> press Ok.
“Change Action Center Settings” in the navigation bar of the Action Center.9 types of message notificatons can be turned of separately.you can choose to remove either one of them or all of them.thats it. In windows 7 notifications balloons are easily disable..
You’ll have to logoff and back on in order to see the change… or to be more correct, you won’t see any popup balloons anymore. you an disable the notification balloon in your computer by clicking on the customize option on the right bottom of your computer. after entering into the customize options there you can disable the notifications whatever you dont want..
Notifications are very natural in Windows 7 Operating System. It might be to update Windows Operating System or update is ready to Install. You can remove the notifications by Clicking on the right bottom of Computer and Click Customize Option. Disable notifications to stop receiving them again. you can easily remove it. go to desktop screen . Right click on it than choose "personalize". Then it will open a folder . You can see a option name "screen saver" choose it . It will open a tab box . choose your option what you want to choose then click "Apply" then click "OK". You can easily disable Notifications Balloon in Windows 7. 1. Click on Arrow button placed beside Time in the Taskbar. 2. Click on Customize in the small dialog box. 3. Now click on Turn System icons on or off. 4. Then, set Action Center as Off. Now, no notifications will come. And then click System and Security . Click Review your computer’s status and resolve issues . Select Change Action Center settings on the left panel. Now, you should remove the tick marks from the notifications. You don’t want to receive in the Security messages and Maintenance settings sections. Tap Run command from start and type regedit -> press Ok. Restart your system once to see the change. Just fallow steps which are given below..
-->Then fallowed by Run command. 3)In the right pane, right-click and create 3 new DWORD registry keys. 5)Repeat steps 1-4, but this time for HKEY_CURRENT_USER\Software\Microsoft\Windows\Curre ntVersion\Explorer\Advanced. *->then unable to connect as HKEY_LCAL_MACHINE\software\Microsoft\Windows\Curre ntVersion it is encorred. *->in the right panel to click and creative f 3new D WORD register keys..
*->just follow the above steps than to find out way to solved..
Open the attachment & copy all the content. Paste it to a new notepad & save it by selecting All files as the type and by putting a .reg extension after the name. A fixed file will appear-double click on the icon to Merge it. Provide the administrator password if prompted. Restart your computer & you'll see that the balloon notifications has been disabled. 4. Right click on the downloaded the .reg file and click on Merge. 6. Log off and log on, or restart the computer to apply. 8. If enabled, don't forget to set your Notification Area Icons customize settings how you like. Finally reboot your system and check out. 1.Firstly right click on the desktop and choose personalize option k.
2.Now open the screen saver option which is present on it k.
3.now you a see a search tab pesent over there now click on it and type your file name or problem k.
This message come on with flag icon. Action center is responsible for balloon notification. Open control panel and then click action center. And turn off the messages notification you not want. And notification not show again. *This message come on with flag icon. *Action center is responsible for balloon notification. *Open control panel and then click action center. *And turn off the messages notification you not want. It is not recommended to turn off windows action center alerts in the form of notifications! 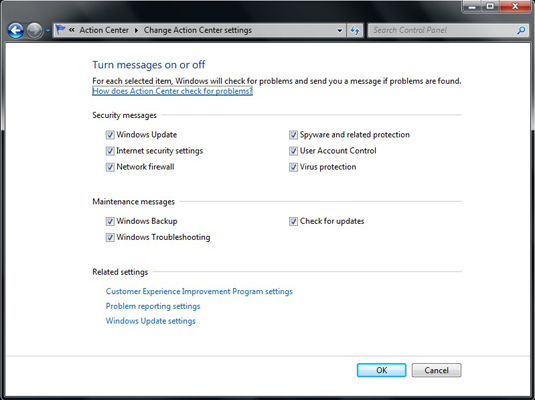 Follow these steps to turn off the notification coming coming from windows action center, 1:First of all, go to task bar 2:Right click on the, task bar 3:Select, properties 4:After that, click on, customize 5:Then, click on, turn system icons on or off at the bottom of the window 6:After that, Turn off the behavior of ACTION CENTER 7:Finally click on, OK That's it over! If you want to turn on the notifications just follow the same steps and turn on the behavior as "ON"! To disable the notification balloons in windows 7.. follow this steps..
Go to Start button.. open Run type regedit,and then press enter. Right click the right side pane,Create a new DWORD value, and them name it Enable Balloon Tips. Double click Enable Balloon Tips, and then give it a value of 0.
if you want to disable select disable option.. In windows seven notifications balloons area unit simply disable.. STEP 1: Open run command from begin or press Windows key + R and sort regedit -&gt; press Ok. STEP 4: Restart your system once to visualize the modification. Click begin, click Run, kind regedit, then press ENTER. Right-click the correct facet pane, produce a brand new DWORD price, then name it EnableBalloonTips. Double-click EnableBalloonTips, then provides it a price of zero. log out Windows, then log back on. It is not counseled to show off windows action center alerts within the style of notifications! Follow these steps to show off the notification returning returning from windows action center, 1:First of all, attend task bar 2:Right click on the, task bar 3:Select, properties 4:After that, click on, customise 5:Then, click on, flip system icons on or off at very cheap of the window 6:After that, shut down the behavior of ACTION CENTER 7:Finally click on, OK that is it over! If you would like to show on the notifications simply follow identical steps and switch on the behavior as "ON"! >>A new window is open you see a option "Action Center"
Now you can easily disable the notification of balloon in window 7..
Click on Arrow button placed beside Time in the Taskbar. Click on Customize in the small dialog box. Then, set Action Center as Off. 1. Click the Start button , click Control Panel , then click System and Security . 2. Click Review your computer’s status and resolve issues . 3. Select Change Action Center settings on the left panel. 4. Now, you should remove the tick marks from the notifications you don’t want to receive in the Security messages and Maintenance settings sections. 1. Click the Start button , type gpedit.msc in the Start Search box and then press ENTER. 2. Click Continue when the User Account Control (UAC) prompts. 4. Double-click Turn off all balloon notifications and set it to Enabled . 5. Close Group Policy Editor and restart the computer. 2.Then you go to the 'Control panel'. 3.Then you go to the 'Action Center'. 4.There you click on the option 'Hide Action an Notification'. 5.Then you click on the option 'Apply' and then 'OK'. To remove notification from appearing on screen, take the following actions. You will get a screen full of icons for notification active and inactive, deselect each one and save , exit , reboot. You wont get notification message again. 1st---Action center is responsible for balloon notification. 2nd---Open control panel and then click action center. 3rd--- turn off the messages notification you not want. then restart your comuter to see these changes. Type "regedit" in the Run command and hit enter . select HKEY_CURRENT_USERS \software\microsoftwindows\currentversion\explorer advanced . and click on right pane . save the changes and restart your device for the changes to takes place . click on the action center . * Now under Icons column "Action Center"
* Now under Behaviour column corresponding to "Action Center" choose "Hide icons and Notifications"
I am providing you the easy steps to disable notifications in the windows 7. Open the Control Panel and switch to one of the icon views. Select the System Icons module. Locate the Action Center option and select off on the drop down box to the right. Close the dialog box and the settings will take effect.